Happy Makeup Wars Monday! Today I’m bringing you my Must Have Vegan Makeup Brushes. I broke it down into top 10 eye brushes and top 10 face brushes. I also share my favorite vegan makeup brush brands. All of these brushes are made with synthetic, man-made fibers. Some of them use recycled materials or renewable bamboo for the handles, too. 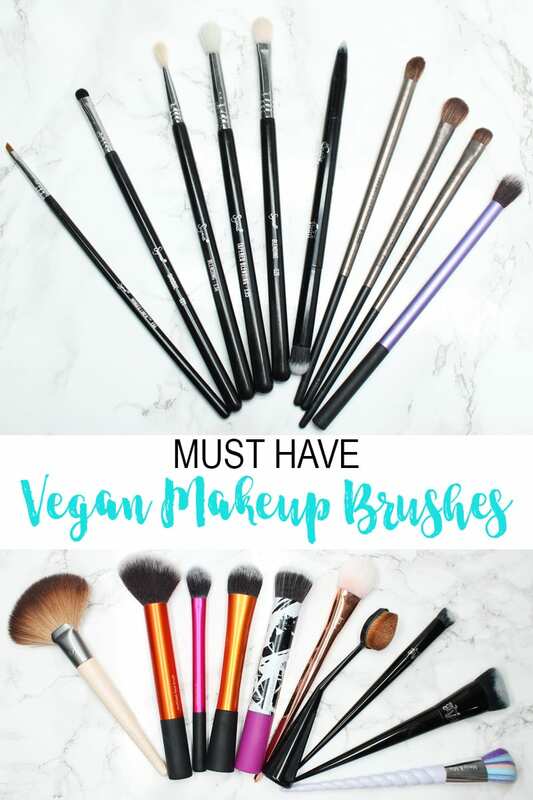 When people ask me what vegan makeup brush brands are out there, here are the ones I suggest. 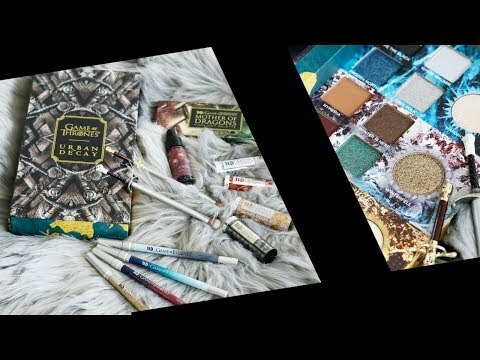 EcoTools, Nyx, Real Techniques and Makeup Geek are good for budget buyers. Urban Decay, Kat Von D, Sigma, Sugarpill, Tarte and It Cosmetics are more midrange and higher brands. You may also be interested in my Best Cruelty Free Makeup Brushes for Gifting guide. 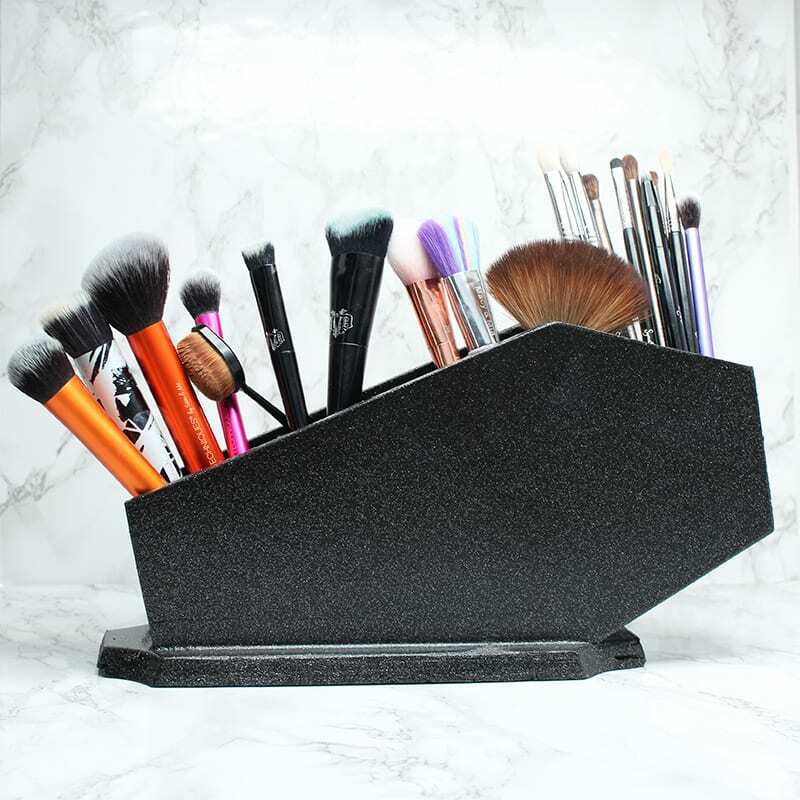 My awesome black glitter coffin makeup brush holder is by Life After Death Designs on Etsy. I have 2 of them to hold all of my makeup brushes. They easily hold my must have vegan makeup brushes with room to spare. The ecoTools Fan Brush is my perfect fan brush that I’ve been search for years to find. It’s the perfect density to blend the edges of blush, contour and highlight. You can also use it to highlight the cheek or sweep away fallout. The handle is made from renewable bamboo, one of the fastest growing plants on the planet. The Real Techniques Multi-tasking Face brush is amazing. It’s great for applying bronzer, applying a very light layer of diffused blush, applying a soft subtle contour, blending out contour, and blending out other face products. The Real Techniques Setting Brush is great for applying highlighter or using to set powder under the eyes. The Real Techniques Expert Face Brush is great for applying cream or liquid foundation. I sometimes use it for powder as well. The Real Techniques Stippling Brush is good if you want to apply foundation sheerly or stipple on a cream blush. The Real Techniques Bold Metals Tapered Blush Brush is great at applying blush. You can also use it to apply contour. I love the cut of the bristles and the way it blends things out. I also love the shape of the brush handle, as it’s easier to store than the really thick handles of the regular Real Techniques brushes. The Cailyn O Brush is excellent at applying foundation. I use it with my most difficult foundations, like the Nyx Total Control Drops, which is hard to blend out otherwise. It works very well with thicker liquids and creams. It can also be used with powders or to apply blush. I thought this brush was gimmicky when I bought it but I’ve been really impressed. It works wonderfully. The Kat Von D Lock-It Edge Foundation Brush is amazing for applying full coverage foundation around the face. The dense bristles conform to the shape of your face, making it easy to cover everything. I also like this brush to apply highlighter and blend it out, which I learned from the Kat Von D Masterclass at the Makeup Show Orlando. The Kat Von D Lock-It Edge Concealer Brush is excellent for precisely blending out concealer around the eyes and the brows. It goes EXACTLY where you lay it, so you never have to worry about concealer in your eyebrows. I love the Kat Von D brush design. They’re beautiful to look at and perfectly weighted. I’ve been loving my Macy and Mia Neon Unicorn Blush Brushes for practicing draping. I use this to pop color below my eyes in an X shape and then blend back towards my hair line. The Unicorn handles are cute, too. The must have vegan makeup brushes for the face that I picked are the ones I reach for daily. The foundation brush differs based on what foundation I’m wearing, but lately the Expert Face Brush or Cailyn O Brush have been the most used. I’m using both blush brushes to work on sculpting my cheeks. I’ve been using the KVD Foundation brush to apply my highlight. I use the KVD concealer brush around the face and eyes for any concealing that I need, as well as to make sure I don’t get foundation on my brows. I soften the edges of my face with the Multi-tasking brush. I blend together my highlight and contour with the fan brush. I’ve been using the setting brush to set under my eyes when necessary. Sometimes a brush just isn’t the right took for my foundation. In that case I rely on my beauty blender to make sure my foundation is fully blended out around my face. It’s also fantastic at blending out my highlight. The Sigma E06 Winged Liner Brush is perfect for drawing the thinnest line possible on hooded eyes. You can use it to tightline, to create a cat eye or whatever you need. It’s seriously the most perfect brush for me for lining. It also works to draw on fine eyebrow hairs. The Sigma E21 Smudge Brush is fantastic for applying color to the lower lid. It’s good at softly smoking out color too. You can use it with pencil liner to smoke it out. The Sigma E25 Blending Brush is reminiscent of my goss 6 brush. It’s that paddle-shaped brush that’s wider one way and thinner the other way. It’s slightly firm, making it good at applying color to the lid to blend into the smoky dome shape on the hood of the eye. It’s also good at blending out colors in the crease. I can do an entire eye look with just this brush. Love it! The Sigma E35 Tapered Blending Brush is what I love to use to soften the colors I’ve blended in the crease, to make sure there are no rough edges. The Sigma E36 Blending Brush is a tiny little brush perfect for hooded eyes. You can use it to define your outer V / outer C shape to blend out color in the crease or to blend out the edges of other colors. The Kat Von D Shade+Light Eye Contour Brush is an awesome brush. You can use it to create natural looks, to cut the crease, to smoke out liner or whatever you like. I use it to cut the crease on occasion. I use it daily to highlight under my eyebrows and apply highlight at the inner corner. It’s awesome. The Urban Decay Pro Tapered Blending Brush is great at blending out colors in the crease. If you go too heavy with your accent color, this brush can help diffuse it. Urban Decay Pro Iconic Brush is good for applying a diffused wash of color to the lid. It’s great at blending out colors onto the hood/crease of the eye. If you need to soften where two colors meet, it can do that too. You can use it to softly define the outer v, too. The Urban Decay Pro Moondust Brush is what I love to use to pack color onto the lid of my eyes. It’s especially great with things like Colour Pop Super Shock or Makeup Geek Foiled eyeshadows. I love the Urban Decay Pro brush design. The handles look elegant. They’re perfectly weighted and tapered. They make you want to choke back on the brush handle rather than hold the brush too close to the bristles. They’re gorgeous. They’re also made from recycled materials. See my Urban Decay Pro Brushes Review. I like to use the Real Techniques Multi-Tasking Eye Brush for soft blending around the crease / browbone area. It’s good at helping to diffuse color without going muddy. 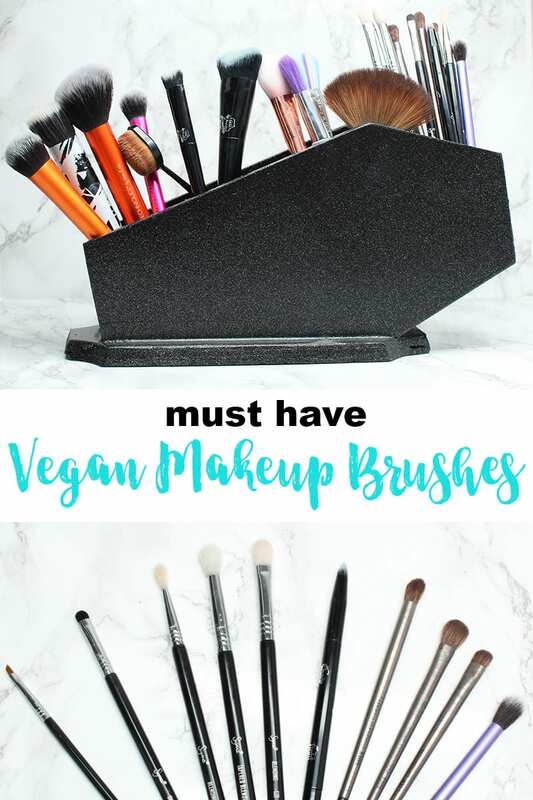 It was really hard to narrow down my must have vegan makeup brushes for the eyes, but these 10 are the ones I use the most. If I’m doing the smoky dome shape, the E25 or Iconic brushes make it easy to lay color down on the lid and blend it into the dome shape. The E21 is perfect for my lower lid color. If I want to line, and I don’t line daily these days, the E06 makes it quick and thin. The E35 is great for making sure everything is smooth and perfectly blended out. I really do switch between a lot of blending brushes to make my eyeshadow look great. 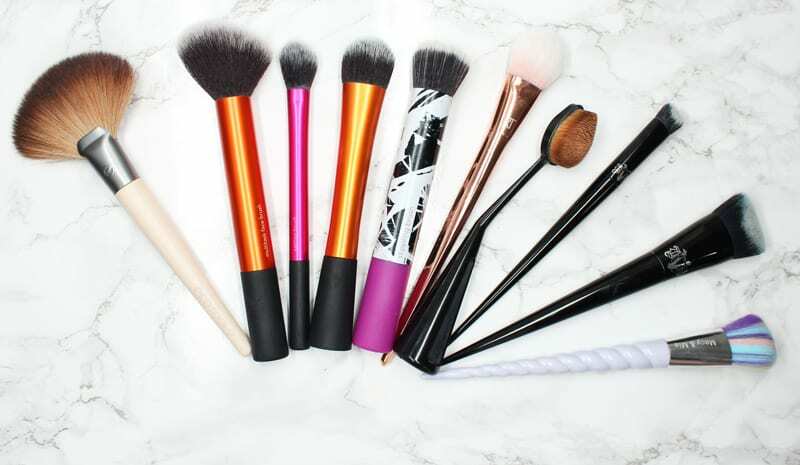 What are your must have vegan makeup brushes? Which ones do you use daily? Wow, love the list of brushes! I’ve been using Sigma for years but since becoming Vegan I don’t like the fact they use animal bristles with some brushes. I switched to Nanshy brushes recently and the quality is the same as Sigma but all brushes are approved by PETA. Lots of love. Hi, I just wanted to let you know the unicorn brush you’ve got (Macy and Mia) is actually a quite common unbranded one from China. I actually quite like a lot of the unbranded Chinese new brushes so no shade here, but it might be handy to know you can get the exact same (and many more designs) for way less on for example Ebay or AliExpress. Many of the manufacturers and sellers on Alibaba allow sellers to customise the brushes to their liking, whether that is a different colour or a logo on the ferrule. As much as I love It Cosmetics, I didn’t even consider that they were a vegan brand. That makes me love them even more. Fantastic picks that you have here! Great list! Do you know if the brand Unicorn Lashes is cruelty free? They say they are on their website, but I can’t find anything online confirming that. I really want some of their unicorn brushes! I did not know about Macy and Mia though, so I may have to get those instead! We share an affinity for Sigma eye brushes. I really like them and they are a good price point. I need to pick up that O brush. Everyone raves about it and I think I have it on my Amazon wishlist. I recommend the LH Cosmetics brushes as well (Linda Hallberg’s new brand). They are vegan and fantastic! Her eye brushes are part of my main rotation right now. I love that they are made of light weight wood and I adore the orange synthetic hair they use in them. It makes them so easy to pick out. And they’re not too pricey if you get a set. They end up being about $10 each (including a VERY nice oversized triangular black powder puff). Great recommendations, Courtney. I also love my Furless brushes, an Aussie brand. They’re reasonably priced and sooo good! 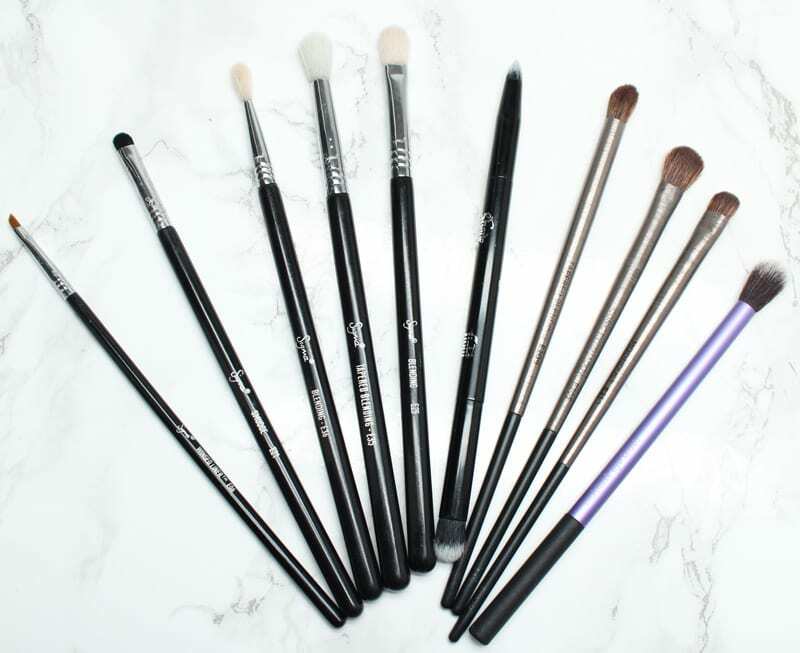 I have several brushes from Sigma that I can’t live without! HOW CUTE IS THAT UNICORN BRUSH? I was looking forward to your post! 🙂 I still haven’t tried the UD brushes, but I know they’ve had great reviews!